of Georgia, Fannin County lies in the Appalachian Mountains, 90 miles north of Atlanta, bordering on North Carolina and Tennessee. 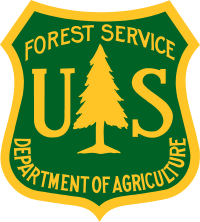 Extending from within the county seat of Blue Ridge to the county border north, south, east and west, more than 100 miles of trout streams and rivers wind through Fannin County across 100,000 acres of the Chattahoochee National Forest. Blue Ridge is a quaint mountain gateway town with art galleries, downtown shopping, delectable restaurants, a scenic railroad, and get-away cabins nestled on mountain ridges, in peaceful valleys and on scenic waters. of Commerce in Blue Ridge. About Gilmer County, GA "Georgia's Apple Capital"
Gilmer County is Georgia’s Apple Capital and contains abundant National Forest lands, including Springer Mountain, the southernmost terminus of the Appalachian Trail in the Chattahoochee National Forest. 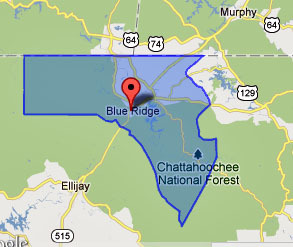 Gilmer County is located along Highway 515/GA Highway 5, about 75 miles north of Atlanta. 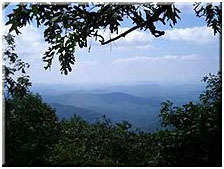 At more than 430 square miles big, the heavily wooded landscape stretches across the southernmost reach of north Georgia’s Blue Ridge Mountains. What is the Trout Adventure Trail? 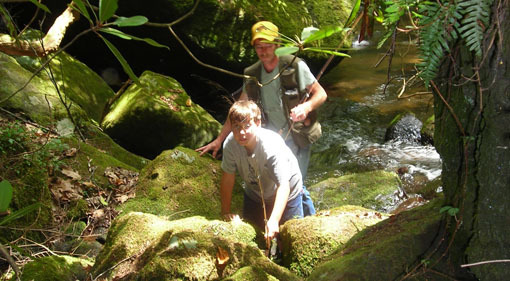 The Trout Adventure Trail® is a "do it yourself" and "plan your own" hiking and learning experience for kids of all ages along legendary trails in the Chattahoochee National Forest in north Georgia. It is designated by the Fannin County Chamber of Commerce as one of the top-12 wintertime activities in the region. 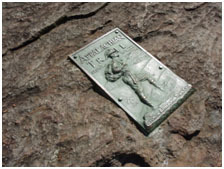 The Trout Adventure Trail offers individual hikers, families and organized groups the opportunity to hike, learn and earn a distinctive commemorative award patch as recognition of the commitment to outdoor education, conservation and accomplishment. The cold water in the streams along the Trout Adventure Trail offers a refreshing bath for tired feet. But hikers on the trail also learn about how the clear cold waters support healthy populations of rainbow, brown and brook trout, as well as a wide assortment of amphibians, insects, mollusks and more. ÜWhat to Bring, ÜCamping on the Trail, and ÜKnowledge from the Trail. Where is the Trout Adventure Trail? For more information, go to: Ü Trout Adventure Trail map and ÜDirections/Parking. þ All of the above! On the Trout Adventure Trail®, you can undertake any or all of these experiences ... and more! 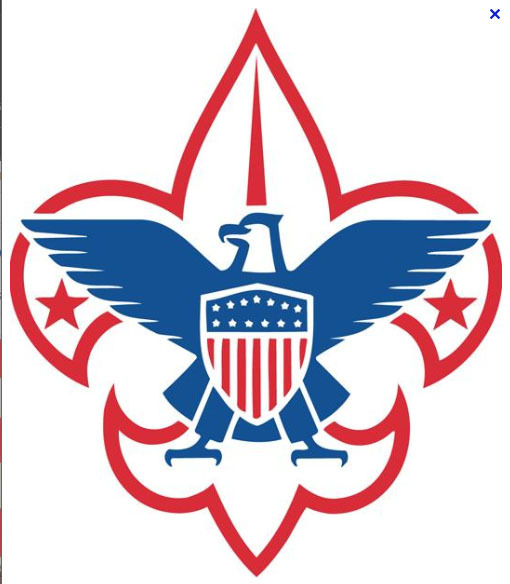 For more information, go to: ÜTeaching Points of the Trout Adventure Trail.